Our custom uniforms for teams or individuals are perfect for practice and gameday. 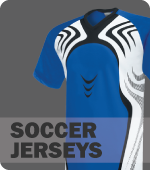 Custom Team Wear is easy to design online at CustomPlanet.com. Start with a blank uniform and add your mascot or create a logo for your team or school. We've got all your athletics covered including: Basketball Jerseys, Baseball Jerseys, Football Uniforms and More! !